The world may be going to Hell in a proverbial handbasket, there’s trouble brewing along the southern border, Congress seems at an impasse with the White House over “the Wall,” and Donald Trump just postponed a trip abroad that had been scheduled for House Speaker Nancy Pelosi. 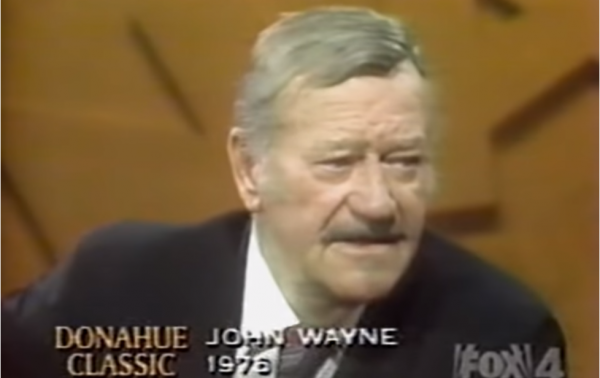 According to a website that has 40 quotes from the epitome of American masculinity—fella by the name of John Wayne—he had what perhaps was a somewhat different perspective. Always be gallant to the ladies, especially if they look like Maureen O’Hara, but if someone hits you with his fist, you hit him back with a chair. His final character, John Bernard Books in the cult favorite The Shootist, spelled out that code in language anybody, with the possible exception of a left-leaning late night comedian, should understand. Known admiringly and affectionately as “Duke,” the late actor had True Grit both on and off screen. His masculinity would never be considered “toxic,” except, perhaps, by some lilting leftie who couldn’t build a campfire in the desert, much less in western Washington or Southeast Alaska, where fire-building is a necessary masculine and hardy feminine art form, and that’s just the least of the problems they might face. Questionably deprived of Oscar nominations for his roles in She Wore A Yellow Ribbon (Capt. Nathan Brittles), The Quiet Man (Sean Thornton), Red River (Thomas Dunson) and The Searchers (Ethan Edwards), Duke Wayne did what men do. He sucked it up and kept making films that pleased audiences, which incidentally, included a lot of very admiring ladies young and old. If they thought of his masculinity as “toxic,” it never showed in box office receipts. Could all of this be much ado about nothing? Presumably, that may depend more upon one’s politics than anything else. Regardless, this is still America, and for many people, all this talk about “toxic masculinity” amounts to so much toxic waste. People can believe what they want, and live by their own personal code. If there’s something toxic about that, there’s a problem. But it’s your problem.